I’m back! It was a great trip down to Florida to see the family. Strangely, it was also cooler in Florida than in Virginia. And not by a little. My thanks to Britt and Diane for covering for me. You two are awesome. Anyway, Chapter 4 Page 26 is up. Blaise makes a run for it, but the dogs are after him. Are the dogs barking in French? Yes. Yes, they are. 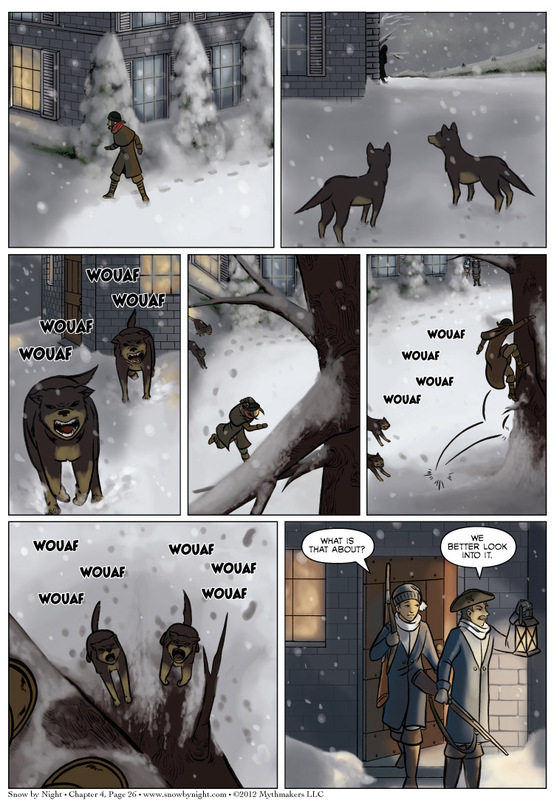 To see what Jassart and Snow-by-Night are up to, vote for Snow by Night on Top Web Comics. Connecticon is coming soon! I’m really excited about this convention. This is our first time up in the Constitution State and Britt and I are really looking forward to it. You can find us in the Artist Colony (colony – I like that) at table AC-21.